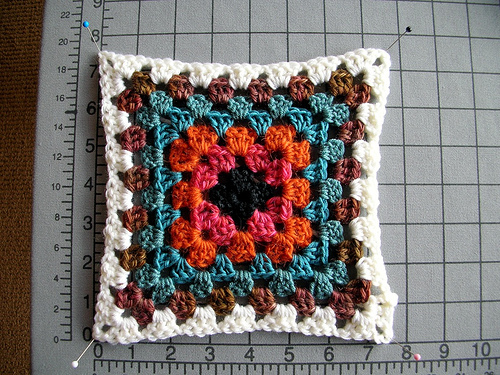 I’ve fielded lots of questions about blocking crochet and knitting recently, and I thought a wee tutorial might be in order. So I spent this afternoon up in the mountains recovering from the last few months, and in so doing I blocked some squares. Here’s the long and short of it; click any photo for more information, or check out the full photo tutorial on Flickr (there are about twice as many photos there*). 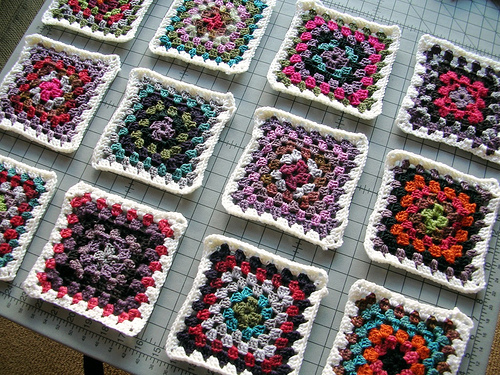 Blocking sets the shape of your pieces (e.g., you can even out edges or help correct unwanted curling). 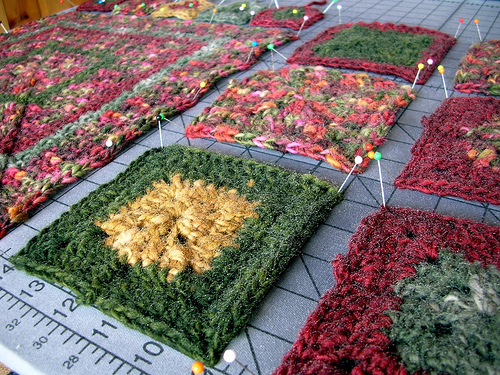 Blocking relaxes and evens out your stitches. Blocking can dramatically improve the drape of your fabric. 1. Note the finished dimensions of the squares (if you’re blocking a garment, use the measurements in the schematic drawing as a guide; from here on I’m only going to refer to squares). 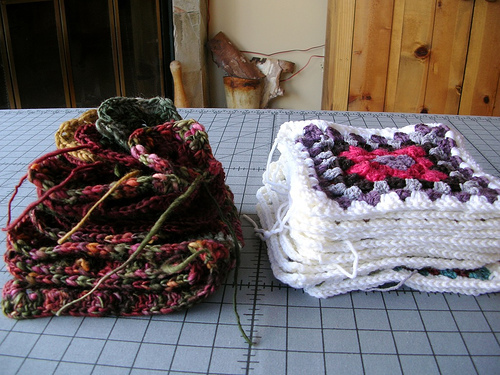 In this example I’m blocking both standard 7-round granny squares (pictured on the right) and several different-size squares for my Babette Blanket. 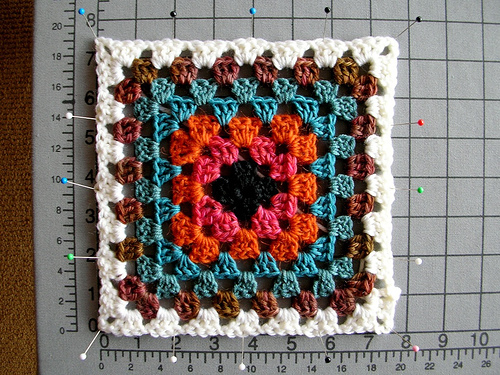 The standard grannies need to be 7.5″ square, and the largest-to-smallest Babette squares need to be 15″, 5″, and 2.5″ square, respectively. 2. Leaving breathing room between them, lay your squares out on a flat surface. In this example I’m using a blocking board**, which is already (after this one use) my new best friend. You could also use a mattress (I would remove blankets first), a clean carpet, or a stack of towels. The bonus of using a blocking board is the super handy grid printed on the fabric lining (also, the lining wicks moisture to speed drying). 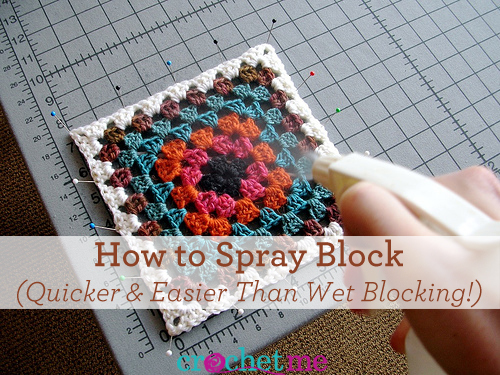 You could make yourself a blocking board using foam board and fabric, too. 3. Grab some pins (but not really; you’d stick yourself). Pin the first corner of the square; any corner will do. 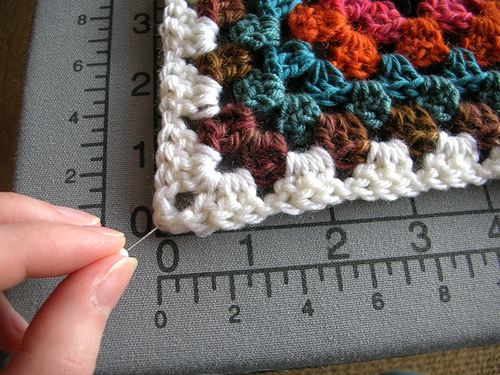 If you’re using a grid, make sure to position the square on the grid so that it’s easy to measure in both directions so you can determine where to pin the other corners. 4. Pin the corner diagonally opposed to the first corner. Continue to pin the remaining two corners. Measure to make sure the pins are equidistant from each other along the edges. In this example, each edge is now 7.5″ across. I had to stretch the edges slightly to achieve this. 5. Notice in the previous photo that pinning the corners caused the edges to curve. Correct this by pinning the center of each edge to the proper dimension. 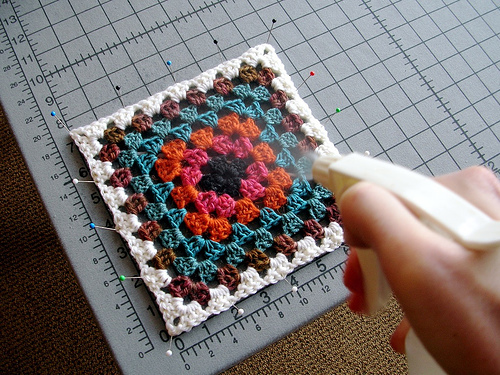 Continue pinning until the edges are flat and square. 8. Once dry, remove the pins and enjoy your work. * There are 19 photos in the Flickr set. I took 173 during the shoot. ** I got my board at Three Bags Full in Vancouver, BC. Lots of local yarn stores carry them, as do some online stores.